Aspens, cottonwoods, poplars – all are names for certain species of trees in the genus Populus. 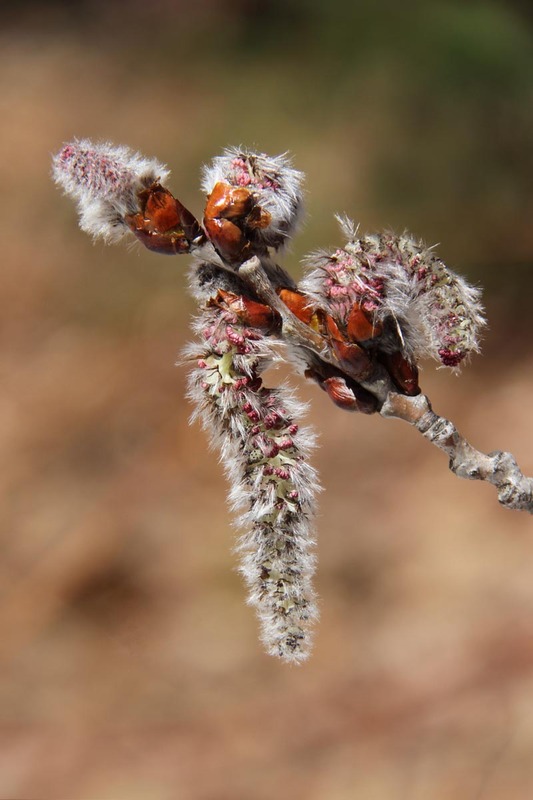 These trees, as well as birch, hickory, oak and willow trees, produce their flowers on spikes called catkins. Telling the catkins of these trees from one another is challenging, to say the least, yet some of NC’s readers correctly identified the catkins in the photograph as those of Bigtooth Aspen, Populus grandidentata. This tree blooms for one to two weeks in the spring and its mature male catkins open and extend to two to four inches in length. The wind, as opposed to insects, disperses the light, fluffy yellow pollen as the catkins dangle in the breeze. Some of the pollen remains intact even after the tree has shed its spent catkins onto the ground. Because Bigtooth Aspen, and most species of Populus, are dioecious (male and female flowers develop on separate trees), there are only male flowers in this photo and beneath this tree. After fertilization, female flowers remain on the tree and form capsules which contain several small seeds embedded in tufts of fine, white hair. They will fill the air in several weeks looking like bits of floating cotton. There are two trees, both in the Birch family, which, due to the similarity of their common names, are occasionally mixed up with each other. One is known as American Hornbeam (Carpinus caroliniana) and the other as American or Eastern Hophornbeam (Ostrya virginiana). Due to the hardness of their wood, they also both go by the name Ironwood, adding to the confusion. A perfect example of when Linnaeus’s binomial system, which gives each species two scientific names, one of which is unique to each species, is helpful. While the fruits and leaves of both species are superficially similar, their respective bark is very different. Carpinus caroliniana’s bark resembles flexed muscles (see https://naturallycuriouswithmaryholland.wordpress.com/2012/10/30/american-hornbeam/ ), earning it yet another common name, Musclewood, while Ostrya virginiana’s bark (pictured) has a “shreddy” appearance, with the bark broken into small, narrow plates which curve away from the trunk. Look for C. caroliniana in valleys and along streams, and O. virginiana on well-drained slopes and ridges. At this time of year there is a species of aphid, Hormaphis hamamelidis, that is laying eggs on Witch-hazel branches. Next spring female aphids will hatch out of these eggs and begin feeding on newly-emerged Witch-hazel leaves. The aphids inject the leaf with a substance that causes the leaf to form a cone-shaped growth, or gall, around the insect, providing it with both food and shelter. The galls are hollow, and have openings extending out through the leaves’ lower surfaces. Within the galls the unmated female aphids produce 50 – 70 young. Eventually the galls fill with winged female aphids which emerge through the cone openings, disperse, and repeat the process. The third generation of aphids consists of both males and females which mate and lay their eggs on Witch-hazel. The aphids that hatch from these eggs create the conical galls found on Witch-hazel leaves. White ash, Fraxinus americana, is relatively easy to identify in winter, between its stout, opposite branches and buds and the corky ridges that form diamond shapes on its bark. 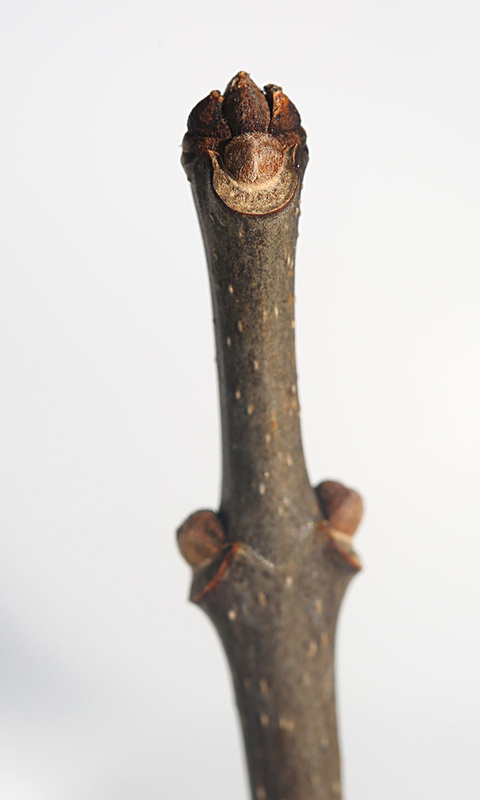 There are several species of ashes, however, and one feature that distinguishes White Ash is the shape of its leaf scars (located beneath leaf buds) on well-developed branches. Each leaf scar (left by a leaf that fell off the tree) is round at the bottom and notched at the top, resembling the letter “C” on its side. (No other ash has c-shaped leaf scars.) It is often concave along the upper edge and the lateral buds are located within the curved portion of the leaf scar.